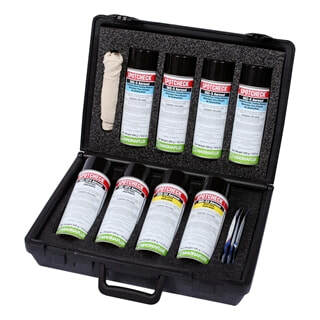 SK Kits are a convenient collection of Magnaflux dye penetrant testing consumable products in easy-to-use aerosol form for Type 2 penetrant non-destructive testing. Each penetrant testing kit comes with SKL-SP2 solvent removable penetrant, SKD-S2 solvent-based developer, SKC-S remover, SCRUBS® hand cleaner towels, a DYKEM® Brite-Mark yellow paint marker and a shop cloth. SK Kits are portable and great for job sites or field inspections to check welds, forgings, pressure vessels, castings, general metal work and many other applications. SK Kits are available in two sizes SK-416 and SK-816, click on the Container Size & Part Number tab for additional information.